Four years after the dust settled on the closure of the Mt. Hood Equestrian Center in Boring, an effort is underway to bring horses and their people back into the arena. Since that time, the large building at 29450 S.E. Lariat Road with the distinctive roofline visible from Highway 26, has been used as the site of legal marijuana grow operations. In its heyday — pun intended — it was a second home to many in the equestrian community. The property passed through several hands in a short amount of time, eventually ending up under the ownership of Boring resident Todd Siverston in 2014. Siverston initially bought the property with the intention of reopening the stables for use. But he soon discovered structural problems that weren't easily repaired. In order to recoup money he'd put into the property, Siverston opted to lease the property to a handful of marijuana growers. To this day, Siverston is working to renovate the space, but he's ready to sell. "It's a beautiful property, and there's still work to be done," Siverston said. Siverston invested a large amount of his own money into renovating the property, fixing the once leaking roof, repairing the siding, repainting the facility and much more. "Had he not fixed the roof, the water lines, we wouldn't even be able to use the property," prospective buyer Samantha MacDonald said. "They've done phenomenal work." "All I was doing was dumping money back into the property," Siverston noted. "The future will tell (what it will become), but as far as I'm concerned, I'm done with it." The asking price is $2.5 million. Unlike the facility's previous occupants, Siverston won't take carrots. Together, Samantha MacDonald and Valerie Teeters, both of Boring, have formed an aspiring 501(c)3 organization, the Arrows of Hope Foundation, with which they hope to purchase and reopen the facility as Mt. Hood Equestrian Center. Their campaign is called "Bringing Back the Hood." They have begun recruiting board members, including Gordon MacDonald, John Lee and Heather Wood. "I want something for our community — for our kids," Teeters said. Besides MacDonald and Teeters, there are three other investors chomping at the bit to buy the property, and all of them hope to return equine activities to the arena. 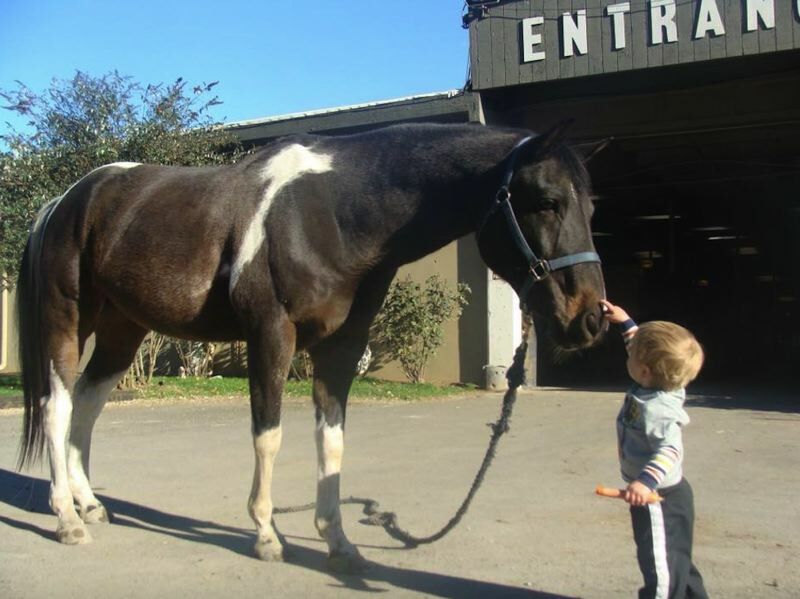 MacDonald grew up right down the road from the Equestrian Center, and has always loved horses. Teeters' children had a similar upbringing, and now she hopes to create that again for her grandchildren. "It was like a hangout place," MacDonald said. "It was the thing to do if you were a horse person." "(Kids) have somewhere to go and something to do other than get in trouble," Teeters added. In the spirit of community, MacDonald and Teeters hope to make Mt. Hood Equestrian Center a community-owned facility, kind of like a 200-stall co-op for the horse community. "The horse community is a good community," Teeters explained. "And I feel like we will make this happen. If someone wants to come in and buy it privately, I'm not opposed to that. I just want it back open again." "The problem with that is no one person can carry the burden financially," MacDonald added. "The reason it will work for the foundation is we have an entire community behind us. I think that's the big difference between making a community barn versus a for-profit (facility)." Several local companies, including Catman Excavation Inc. of Boring, have offered to donate labor to the effort if MacDonald and Teeters are successful in purchasing the property. The team would only have to buy supplies. The duo is approaching this opportunity in a way that involves the community and keeps them informed. They held an informational meeting about the property on May 7 at the Boring-Damascus Grange. "Our goal is to be completely transparent," MacDonald noted. "With finances — everything. If you ask a question and we don't know the answer, we're going to tell you we don't know the answer. ... We want to give (the community) an opportunity to ask their questions and also give their ideas. It takes a village to get something like this to go. And we're looking for our village." As things stand, MacDonald and Teeters are in the No. 2 buyer position, behind a prospective buyer from California. Siverston said the buyer from California is interested in forging a lease agreement with MacDonald and Teeters. But that doesn't mean MacDonald and Teeters are out of the game. "If my current sale falls through, I'd offer it to them again," Siverston said. The offer by MacDonald and Teeters met the asking price, but on a payment plan with a $300,000 down payment. "We have proved we have a vested interest," MacDonald explained. Regardless of the raised eyebrows caused by the current use of the space, MacDonald said her purpose in making an offer to buy the building isn't a vendetta against pot growers. "We don't have a dog in the fight concerning the marijuana operation," MacDonald noted. "Our focus is to bring the horse community back together." Over the past few years, Lariat Lane neighbor Norman Rice has proved himself as an outspoken opponent of the marijuana operation. And on May 18 he filed a lawsuit in U.S. District Court, an effort to force the marijuana grow out of the former equestrian center. Rice claims the marijuana grow is a "criminal enterprise." "It's too bad it had to come to this," Siverston said in response to the lawsuit. "I'm not personally in the marijuana business (and) all the marijuana people will be off the property within a few weeks. The people interested in buying it want to lease it to the equine people." The Post reached out to Rice for comment and he said he could not talk about the lawsuit given that it's pending litigation. Rice claims in his lawsuit that it was always Siverston's intention to make the property a hub of marijuana production and processing and refers to the activity taking place on the property as "racketeering." "Plaintiffs have been damaged by a criminal enterprise (the 'Marijuana Operation') producing and processing marijuana at the Lariat Lane Property and other properties, and then trafficking that marijuana," the lawsuit claims. "Plaintiffs seek redress under the Racketeer Influenced and Corrupt Organizations Act ('RICO'), which requires those who engage in racketeering activity, including production and sale of marijuana as a controlled substance, to pay treble damages, reasonable attorney's fees and cost to those whom they injure. Plaintiffs also seek damages for private nuisance." Treble damages, in U.S. law, is a term that indicates that a statute permits a court to triple the amount of the damages to be awarded to a prevailing plaintiff. The lawsuit claims Siverston bought the property in 2014 "for use by the marijuana operation, managed the marijuana operation, made financial investments in the marijuana operation and knowingly received proceeds from the trafficking of marijuana by the marijuana operation" and with the intention "to exploit the decriminalization of marijuana ... by expanding their marijuana production and trafficking operation," which Rice claims Siverston already had a stake in. He said Siverston's renters have been processing marijuana, which is not permitted given the zoning of the property. Siverston told The Post that one renter had unsuccessfully applied with the county to be allowed to process on the property a few years ago, so processing has never happened at the Lariat Lane location. Rice also claimed Siverston, and the 42 other defendants listed in the lawsuit, recruited medical marijuana card carriers in an effort to "stack cards." Rice is seeking restitution for the damage the marijuana operation has allegedly caused to his property value and quality of life. He claims the odor from the operation, the heavy traffic that consistently enters and exits the property — often by crossing Rice's easement, and just the "criminal" nature of the neighboring operation might "discourage" prospective buyers interested in his property. The lawsuit also claims Oregon violates federal law by allowing the production of marijuana. It's unclear if Rice would drop the lawsuit if the property changed hands and the marijuana grow departs, but Siverston and the Arrows of Hope Foundation are still optimistic that the lawsuit won't stand in the way of the real estate sale. MacDonald would prefer the center be sold to the foundation, and said "we would support (the buyer) in any way we could because we have no reason not to, but as far as being involved, the Arrows of Hope Foundation is about the refurbishing for the horse community." If the buyer didn't decide to lease the stalls along with the arena, MacDonald noted, "We can't really have a horse show if we don't have stalls to board (horses) overnight." "We're not comfortable having the community support this if there's no guarantee," she explained. "We're not going to ask people to (invest in) the property if we cannot purchase the property or get a long-term lease. Our leasing is definitely subject to the terms of the lease. We have to make sure we protect the people supporting us." If Siverston were to decide to sell to the foundation, MacDonald said they'd be ready to breathe new life into the center. "It's really our heart's desire to own it," she added. "The whole thing is we just want it back for the kids."